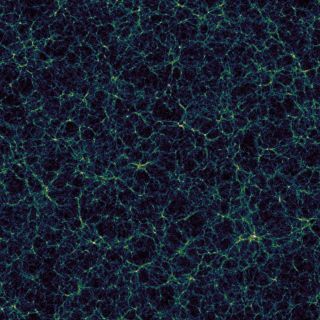 This simulated view of the large-scale structure of the universe shows the vast cosmic web of galaxies, as well as the dark, empty expanses of the cosmic voids in between. By analyzing the giant voids of the cosmos, scientists now have more precise maps of matter in the universe, a new study finds. This strategy of looking at what's not there (as opposed to what's actually present) might help solve cosmic mysteries such as the nature of dark matter and dark energy, and whether or not extra forces of the universe exist, scientists added. This pattern of voids and clusters, strings and sheets of galaxies originated with fluctuations in the density of matter when the universe was young and small, which magnified as the universe expanded. "Voids are mostly neglected in studies of the large-scale structure of the cosmos, but they actually dominate the volume of the universe," said study lead author Nico Hamaus, a physicist at Ludwig Maximilians University of Munich. However, voids are not completely empty space. For one thing, "there are galaxies in voids, but much fewer, on average," Hamaus told Space.com. In addition, just like matter-dominated parts of the universe, voids are permeated by dark matter, the invisible substance that prior work suggested makes up five-sixths of all the matter in the universe, and influenced by dark energy, which is driving the accelerating expansion of the universe, Hamaus said. In the new study, researchers examined data from the Sloan Digital Sky Survey to analyze the gravitational effects that matter surrounding voids had on the voids. The computer simulations they developed focused on how the voids expanded and grew emptier over the eons. Specifically, the scientists wanted to see if the way that voids changed over time deviated from predictions made by Einstein's general theory of relativity, the best explanation so far of how gravity works. Such discrepancies could point the way to better theories of gravity, and perhaps help solve cosmic mysteries, such as why the universe's expansion is accelerating. Many physicists currently blame this acceleration on dark energy, saying that it could make up more than 70 percent of the cosmos. However, so much remains unknown about dark energy that some researchers wonder if it exists at all, and instead suggest alternative models of gravity that could explain these findings. "Voids are empty. They're boring, right? Galaxies are like the cities of the universe, full of bright lights and activity, and voids are like the miles and miles of quiet farmland in between," study co-author Paul Sutter, an astrophysicist at Ohio State University in Columbus, said in a statement. "But we're looking for bits of evidence that general relativity might be wrong, and it turns out that all the activity in galaxies makes those tiny effects harder to see. It's easier to pick up on effects in the voids, where there's less distraction — like it's easier to spot the glimmer of a firefly in a dark cornfield than in a lit-up city bustling with nightlife." Taking voids into account led to a fourfold boost in precision regarding measurements of how the universe's visible matter is clustered together, the researchers said. Sutter likened their new technique to learning more about Swiss cheese by studying the holes. "These results conclusively demonstrate the power of voids to do science," Sutter told Space.com. The new findings did not find any conflicts with Einstein's theory of gravity. "We find that gravity works the same in these under-dense regions as it does in other parts of the universe," Hamaus said. "Our results are consistent with 'vanilla' cosmology — a universe dominated by dark energy, and no apparent deviations from general relativity," Sutter said. "However, we have only begun to unlock the potential of void-based cosmology. If something funny is going on in the universe, it will show up in the voids first." Future research can gather more data about voids and develop more accurate models of void behavior to help solve cosmic mysteries, Hamaus said. For example, analyzing void behavior could shed light on the nature of the particles that might make up dark matter, such as whether they are relatively fast-moving or not, Hamaus said. "Who knows what we'll be able to uncover, but voids have a surprising number of applications in cosmology," Sutter said. "However, when it comes to voids, the most limiting factor is that there just aren't very many of them — they're large, which means they take up a lot of volume. That will always limit our statistical conclusions." The scientists detailed their findings in a paper accepted online July 26 by the journal Physical Review Letters.